1 1. What is the meaning of the term "mollusk"? 3 3. Are all shells found on beaches? Where else are they found? What areas of the world offer the largest variety of shells? 4 4. Describe the movement of shells from place to place. 5 5. How do shell animals protect themselves? 6 6. How are shells made and from what materials are they made? 7 7. List and explain five uses made of shells by man. 8 8. 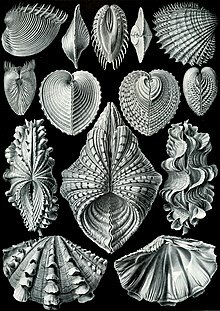 Explain the terms "univalve" and "bivalve" as applied to shells. 9 9. Name in common terms five different classes of shells and name in your collection a shell for each class. 10 10. Make a collection of 20 different shells, classify them, and tell where each is found and when it came into your possession. 11 11. What is the source of pearls? What spiritual lessons does the pearl teach us? Read and discuss Christ's Object Lessons by Ellen G. White, pages 115 to 118. The Shells Honor is an optional component of the Zoology Master Award (available only in the South Pacific Division) . 1. What is the meaning of the term "mollusk"? Mollusk is another name for shellfish. A mollusk is a soft-bodied invertebrate of the phylum Mollusca, typically with a hard shell of one or more pieces. The word "mollusk" comes from the Latin meaning "soft, flexible, tender" referring to the mollusk's soft body parts. We present here a diagram that features many, many more details of a mollusk's anatomy than are called out in this requirement. See the features depicted in bold text are required - the rest are just additional information. The mantle is an organ covering the soft parts of a mollusk. It secrets calcium carbonate to create the shell. The foot is the largest visible portion of a mollusk other than the shell. It is the soft part that protrudes from the shell and touches the surface of whatever the mollusk is crawling on. The "teeth" of a mollosk are called radula by scientists. They are more like a jagged tongue than they are like teeth (see the diagram on the right). Mollusks use them to chew food and to scrape algae from rocks. Ribs are any raised ridges on the surface of a shell. A valve is half the shell of a mollusk with a two-part shell. The two valves are joined by a hinge. These mollusks are called bivalves, and include clams, oysters, and mussels. The dorsal border is the edge of a bivalve's shell where the hinge is located. The apex is the tip or point of the shell. It is not labeled in our diagram, though it is clearly visible (lower right). The operculum is a hard structure situated at the end of the foot, and is used to seal off the entry to the shell. You can think of it as a combination shoe/door. Many marine gastropods are burrowers, and have soft siphons or tubes that extend from the mantle. Sometimes the shell has a siphonal canal to accommodate this structure. These siphons act as snorkels, enabling the animal to continue to draw in a water current containing oxygen and food into their bodies. The siphons are also used to "taste" the water, in order to detect prey from a distance. 3. Are all shells found on beaches? Where else are they found? What areas of the world offer the largest variety of shells? Shells are found in many places other than the beach, including river banks, river bottoms, lake shores, lake bottoms, and the seafloor. They are also found on land, as snails belong to the mollusk phylum. The Caribbean and the Western Pacific are home to the largest variety of shells. 4. Describe the movement of shells from place to place. Mollusks have several methods of getting around, depending on the species. Some have tiny hair-like structures on the foot called cilia which they use to propel themselves through a slimy substance they secrete. Others generate waves of motion along the length of the foot. Still others pump water through their shells and let the resulting jet push them forward. Mollusks can also be moved by water currents. 5. How do shell animals protect themselves? Mollusks pull the soft portion of their bodies into their shells and seal the entry with their operculum. They can also burrow below the surface of the seafloor, river banks, river bottoms, or lake banks and lake bottoms. 6. How are shells made and from what materials are they made? Shells are formed when the animal secretes calcium carbonate from the mantel. The calcium carbonate hardens into a shell. The apex of the shell is formed first, and as the animal grows, more is added to the shell at the opening. 7. List and explain five uses made of shells by man. Shells have been used in many cultures as a form of money. Buttons were originally cut from shells. Plastic buttons we use today still resembled the pearly surface of the inside of a seashell. Many cultures made (and make) jewelry from shells. Holes can be drilled into shells to make beads. Shells are also inlaid into wood in an artform called intarsia (also in marquetry and parquetry). Shells have been cut to shape and used to comb hair. The markers (often round dots) between the frets on the fingerboard of a guitar (or other stringed instrument) are made of shell. Shells were used to make spoons, knives, cups, and dishes by primitive cultures. Shells are made from calcium carbonate, a chemical useful in the laboratory. Calcium carbonate is widely used medicinally as an inexpensive dietary calcium supplement or antacid. It is also used in the pharmaceutical industry as a base material for tablets of other pharmaceuticals. Seashells can be crushed to make lime which is used to raise the pH level in soil. 8. Explain the terms "univalve" and "bivalve" as applied to shells. A bivalve is a mollusk with a two-part shell, such as an oyster, clam, scallop, or mussel. A univalve is a mollusk with a one-part shell, such as a snail, conch, or whelk. 9. Name in common terms five different classes of shells and name in your collection a shell for each class. Bivalves typically have two-part shells, with both valves being symmetrical along the hinge line. The class has 30,000 species, including scallops, clams, oysters and mussels. Bivalves are exclusively aquatic; they include both marine and freshwater forms. However some, for instance the mussels, can survive out of water for short periods by closing their valves. Bivalves are unique among the molluscs for lacking a radula; they feed by siphoning and filtering large particles from water. Some bivalves are epifaunal: that is, they attach themselves to surfaces in the water, by means of a byssus or organic cementation. Others are infaunal: they bury themselves in sand or other sediments. These forms typically have a strong digging foot. Some bivalves, such as scallops, can swim. The radical structure of the bivalves affects their behavior in several ways. the most significant is the use of the closely-fitting valves as a defense against predation and, in intertidal species such as mussels, drying out. 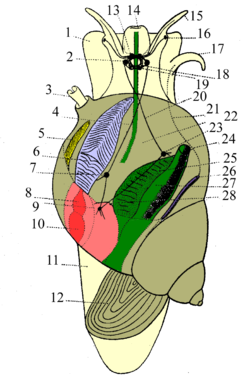 The entire animal can be contained within the shell, which is held shut by the powerful adductor muscles. This defense is difficult to overcome except by specialist predators such as the Starfish and Oyster Catcher. The gastropods, also previously known as gasteropods, or univalves, and more commonly known as snails and slugs, are the largest and most successful class of mollusks, with 60,000-75,000 known living species. This class of animals is second only to insects in its size and diversity. The class Gastropoda includes very large numbers of marine snails and sea slugs, as well as the freshwater snails, and the terrestrial (land) snails and slugs. Although the word snail can be, and often is, applied to all the members of this class, very commonly the word "snail" is restricted only to those species which have an external shell. Those without a shell, or with only a very reduced or internal shell, are often known as slugs. The marine shelled species of gastropod include abalone, cowries, conches, periwinkles, whelks, so the word snail can be used to apply to them and the majority of other sea snails which have coiled seashells. There are also a number of families of species where the shell is coiled only in the larval stage, such as all the various limpets. The class Cephalopod contains two subclasses. In the Coleoidea, the mollusk shell has been internalized or is absent; this subclass includes the octopuses, squid, and cuttlefish. In the Nautiloidea the shell remains; this subclass includes the nautilus. There are around 786 distinct living species of Cephalopods. Chitons or coat of mail shells are small to large, primitive marine mollusks in the class Polyplacophora. There are 900 to 1,000 extant species of chitons in the class Polyplacophora. Chitons are also sometimes commonly called sea cradles and they may also be referred to as loricates, polyplacophorans, and rarely polyplacophores. Chitons have a shell composed of eight separate but shelly plates, which are held together with a structure known as a girdle. Chitons live on hard surfaces such as on or under rocks, or in rock crevices. Some species live quite high in the intertidal zone and are exposed to the air and light for long periods. Others live subtidally. A few species live in deep water, as deep as 6,000 m .
Chitons have shells made up of eight overlapping calcareous valves held together and surrounded by a girdle. In many species the surface of the girdle is covered in, or decorated with, scales, hair-like protrusions, or glassy bristles. After a chiton dies, the individual valves which make up the 8-part shell come apart, and may sometimes wash up in beach drift. The individual shelly plates from a chiton are sometimes called "butterfly shells" because of their shape. The tusk shells vary in size from very small to medium sized. The official name of this class is Scaphopoda, meaning "shovel-footed". These mollusks live on soft substrates offshore (usually not intertidally). Because of this subtidal habitat and their small size, many beachcombers are unfamiliar with them; their shells are usually not nearly as common or as easily visible in the beach drift as the shells of sea snails and clams. 10. Make a collection of 20 different shells, classify them, and tell where each is found and when it came into your possession. You may be able to find a field guide at your local library too. 11. What is the source of pearls? What spiritual lessons does the pearl teach us? Read and discuss Christ's Object Lessons by Ellen G. White, pages 115 to 118. A pearl is a hard, rounded object produced within the soft tissue (specifically the mantle) of a living shelled mollusk. The finest quality pearls have been highly valued as gemstones and objects of beauty for many centuries, and the word pearl has become a metaphor for something rare, fine, and admirable. Technically speaking, under the right set of circumstances almost any shelled mollusk can produce some kind of "pearl". However, most molluscan "pearls" have no luster or iridescence. In fact, the great majority of mollusk species produce pearls which are not attractive to look at, and not durable, such that they usually have no value at all, except perhaps to a scientist, or as a curiosity. Desirable pearls are produced by two very different groups of molluscan bivalves or clams: marine pearl oysters from the family Pteriidae and freshwater pearl mussels from the order Unionida, families Unionidae and Margaritiferidae. These two families of bivalves have shell linings that are composed of nacre, or "mother of pearl" as it is more commonly known. A valuable natural pearl is entirely made from layers of nacre, using the same spontaneous process as is used in the creation of the nacre lining the shell. Pearls are formed inside the shell of certain bivalve mollusks. As a response to an irritant inside its shell, the mollusk creates a pearl to seal off the irritation. The mantle of the mollusk deposits layers of calcium carbonate (CaCO3) in the form of the minerals aragonite or calcite (both crystalline forms of calcium carbonate) held together by an organic horn-like compound called conchiolin. This combination of calcium carbonate and conchiolin is called nacre, or as most know it, mother-of-pearl. The commonly held belief that a grain of sand acts as the irritant is in fact rarely the case. Typical stimuli include organic material, parasites, or even damage that displaces mantle tissue to another part of the animal's body. These small particles or organisms enter the animal when the shell valves are open for feeding or respiration. There are many spiritual lessons that can be drawn from a pearl. First is that pearls are fairly rare, and highly valuable. When Jesus told his parable of the pearl, everyone in his audience understood that if a person were to find a pearl in nature, it would be his free for the taking, and it would make him rich. Jesus was offering them eternal life - also free for the taking, and highly valuable. A second lesson can be drawn from the way a pearl is made. It starts out as an irritant which the mollusk covers and turns into an item of beauty. In the same way, Christ covers our irritants with his robe of righteousness, converting us from miserable, doomed sinners into heirs of the eternal kingdom. Ellen White's book Christ's Object Lessons can be read online. The pages called out here can be found here. Leviticus 11:9,10 a. Water creatures were created on what day? Acts 16:14 b. The number of water creatures is innumerable. Isaiah 50:2 c. Water creatures perish out of water. Revelation 21:21 d. Job considered coral of great value. 1 Timothy 2:9 e. Solomon was acquainted with marine life. Genesis 1:20, 21 f. Jesus twice used a shell product to teach a spiritual lesson. 1 Kings 4:33 g. A businesswoman was engaged in selling the famous purple dyes secured from the shellfish Mediterranean Murex. Psalms 104:25 h. Paul does not support the wearing of pearls. Matthew 7:6; 13:45,46 i. Shell creatures are unfit for food. Job 28:18 j. The twelve gates of Holy City are twelve pearls. All scripture passages below are from the New International Version. a. Water creatures were created on what day? b. The number of water creatures is innumerable. c. Water creatures perish out of water. When I came, why was there no one? Was my arm too short to ransom you? d. Job considered coral of great value. e. Solomon was acquainted with marine life. f. Jesus twice used a shell product to teach a spiritual lesson. g. A businesswoman was engaged in selling the famous purple dyes secured from the shellfish Mediterranean Murex. i. Shell creatures are unfit for food. j. The twelve gates of Holy City are twelve pearls.